She may be almost royalty but that hasn’t stopped Kate from hitting up her favorite chain stores. The super svelte bride to be recently went on a honeymoon shopping binge, picking up pretty summery dresses at Warehouse. Copy her look with our product picks below. She may have haute couture access and designers dying to dress her but Kate’s still sticking with her High Street retail chain favorites when it comes to honeymoon style. The very modest Middleton recently popped into popular chain store Warehouse to scoop up three colorful little summery dresses – each retailing for around $100. The princess bride reportedly purchased a poppy print dress, and a short tropical bird printed frock, according to insiders. The colorful finds would be the perfect pieces to pack for her super secret honeymoon if the couple winds up jaunting off to Jordan or Mustique, as reported. Kate also stopped into retail giant Banana Republic. Self-admittedly a huge fan of the label, she scooped up a few looks from the company’s brand new summer collection. Want to score a similar look for summer? Even if you’re not jet setting off to a tropical paradise, try these seasonal styles to give your summer wardrobe a regal touch. This printed little T-Bags dress ($194), with its delicate cap sleeves and flirty hemline, puts a summery spin on the classically Kate wrap. This unfussy strapless dress($59.99) is just the sort of piece to pull on for graduation parties, picnics, or afternoon errand running. A ruffled minidress in a fruit punch pantone is totally on trend for summer. 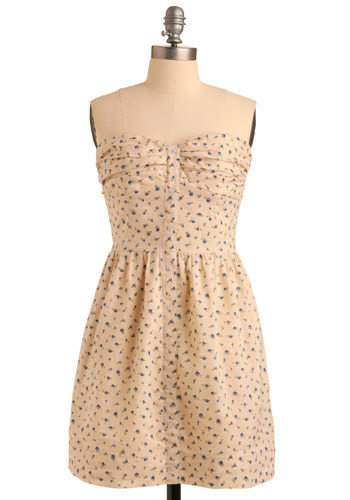 This dress ($36.50)is easy, breezy, and best all, completely affordable.